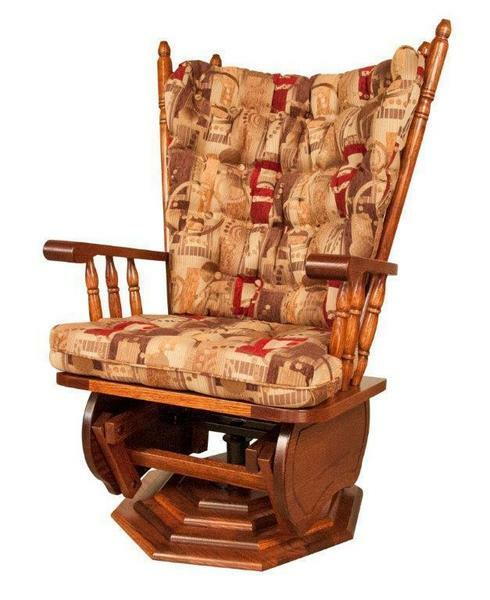 Our Amish Swivel Glider is a traditional-style glider with turned spindles forming the upper frame of the chair that makes for a cozy way to unwind. Other features of this lounge chair include scroll arms, high cushioned back and seat upholstered in your choice of fabric from a variety of options, and an octagonal layered base. Enjoy years of comfort in this glider that can be made in your choice of wood type and finish to match your home.